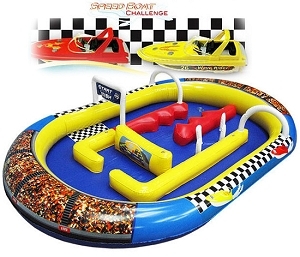 The RC Speed Boat Challenge is a portable inflatable track built for remote controlled speed boats. The purpose of the track is to allow you and friends to set up a “challenge” track to race your boats against each other. The track includes obstacles and sharp corners making it a big challenge for those racing. The inflatable track measures 1525 x 915 mm and can be used both indoors and outdoors. Two RC speed boats come included in the pack (1 red and 1 black) and each can be operated up to 50 feet away. The set costs £34.99 and is available via the product page link below.